Gun Carriage Factory (GCF) Jabalpur is going to conduct written test for the posts of Supervisor (NT/OTS) on 25 September 2016. Earlier the application process for these posts had been completed. The written examination will have 200 objective type questions. 0.25 negative marks will be deducted if wrong answer is given by a candidate. Now the Admit card of GCF Exam had been released. 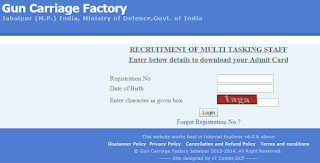 Applicants can download GCF Jabalpur Exam Admit card from here. Earlier Gun Carriage Factor Jabalpur had completed the application process to fill up Supervisor posts. Now GCF is going to conduct written exam for these posts on 25 September 2016. For that GCF Admit card had been released. Question paper will be bilingual i.e. in English/Hindi except Part-C (General English) which will be set in English only. Merit of the candidates will be decided on the basis of the total marks scored in the Written Examination. Supervisor (NT/ OTS) exam will be held on 25 September, 2016. The admit card for these posts are available now. All the important details like exam venue, roll number, date and time etc. had been mentioned in them. Earlier GCF Jabalpur had invited applications and now the exam is to be held as per the selection process. The Examination will consist of MCQs of 200 marks. Questions will be asked from General Intelligence, English, Numerical Aptitude, Basic Computer concepts and General Awareness. Question paper will be bilingual i.e. in English/Hindi except Part-C (General English) which will be set in English only. The issue of Admit Cards for Written Examination, Declaration of Results, intimation for issue of Admit Cards, scheduling of Examination Dates will be done online through GCF’s Website ofbgcf.nic.in only. In order to download the admit card for GCF Jabalpur exam, candidates need to visit the direct link provided here. It will take you directly to download page. Then candidates need to enter their registration number, date of birth and characters shown in the box and click login. Their GCF Admit card can be downloaded from there.